These FLYOVER KIT vinyl graphics are Pre-cut and designed specifically to fit the sides and hood of 2013 2014 2015 2016 2017 2018 and 2019 Ford EcoSport SUV Sport Utility. 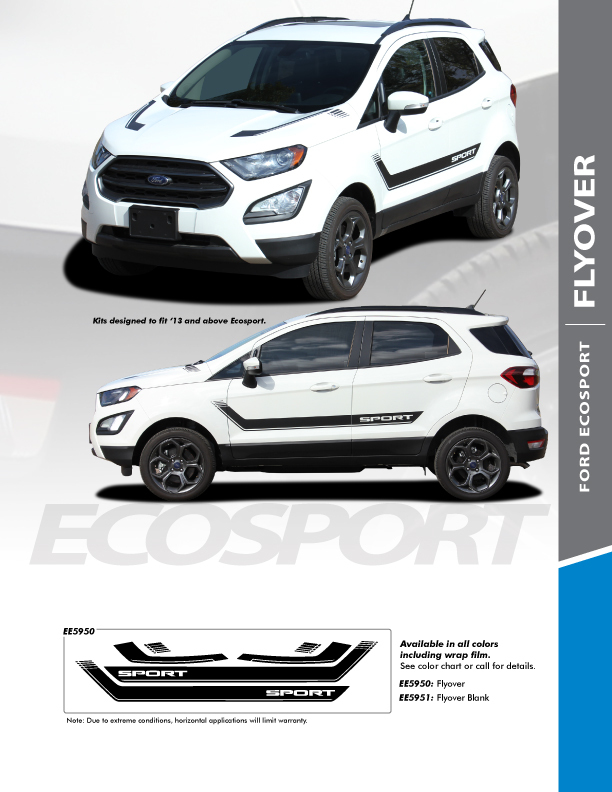 This FLYOVER KIT for EcoSport side stripes kit is guaranteed to add OEM style your Ford EcoSport SUV. Ford EcoSport Vinyl Graphic Decals FLYOVER KIT Ford EcoSport Stripes, EcoSport Decals, EcoSport Hood Stripes, EcoSport Side Door Stripes. Hood, Both Left and Right Side Stripe Graphics.